Step off the beaten path and head to Kolb Studio and Hermit Trail. Navajo Bridge and Grand Canyon Railway Depot will appeal to history buffs. Change things up with these side-trips from Grand Canyon National Park: Mooney Falls (in Supai) and Vermillion Cliffs Scenic Highway (in Marble Canyon). On the 1st (Mon), hike the day away at Bright Angel Trail. And it doesn't end there: take some stellar pictures from Lipan Point, trek along South Kaibab Trail, appreciate the history behind Powell Point, and tour the pleasant surroundings at North Kaibab Trail. To find traveler tips, reviews, and other tourist information, read Grand Canyon National Park online tour planner . June in Grand Canyon National Park sees daily highs of 85°F and lows of 42°F at night. Finish your sightseeing early on the 7th (Sun) to allow enough time to travel back home. Start off your visit on the 8th (Mon): tour the pleasant surroundings at Avalanche Lake. 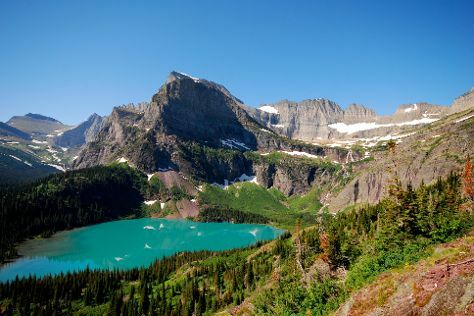 On the 9th (Tue), you'll have a packed day of sightseeing: take in the dramatic natural features at Grinnell Glacier, stroll through Highline Trail, then appreciate the extensive heritage of Garden Wall, and finally take in the dramatic natural features at Jackson Glacier Overlook. To find where to stay, maps, and tourist information, refer to the Glacier National Park trip maker site . You can drive from Grand Canyon National Park to Glacier National Park in 19.5 hours. In July, daytime highs in Glacier National Park are 85°F, while nighttime lows are 49°F. You will leave for home on the 11th (Thu).